Today is the birthday of John Clifford Brian Gysin (1916-1986). Known as a (re)discoverer of what he called the "Cut-Up Method" in literature, he was a prolific, unconventional and non-conformist experimenter in art, literature, music, performance, film, technology, and in the ideas behind these experiments -- ideas too simple and too complex to be called philosophy or theory they way they are usually understood. 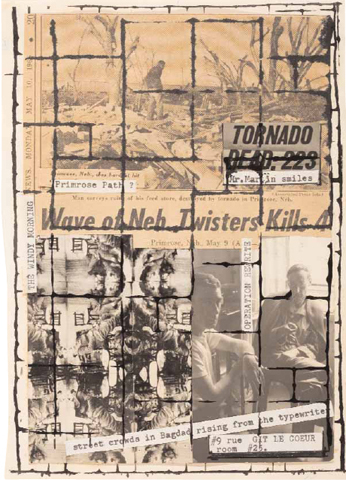 Gysin introduced William Burroughs to the “cut-up” technique during their Paris “Beat Hotel” days, and the process became most influential through Burroughs’ experimental fiction of that period, such as Nova Express. It was through the influence of Burroughs that Gysin's ideas came to the attention of the young Jean-Michel Basquiat, many years later. Invented in 1959 (the year I was born) the "Cut-Up" was a technique of utilizing chance and disjunction adapted and transformed from similar experiments by the Dadaists, such as Jean Arp’s Untitled (Collage with Squares Arranged according to the Laws of Chance), created the year Gysin was born. Gysin began by deliberately cutting newspaper articles into sections, which he randomly rearranged into a new text. Cutting into small pieces of one or few words creates an almost abstract poetry, while using longer snippets reads more like disjointed prose. William Burroughs adapted the technique into what he called Fold-In, starting with two whole pages of linear text, folding each sheet in half vertically, and reading across the resulting page. Burroughs later claimed "When you cut into the present the future leaks out." The collaborative book Minutes to Go was created with extensive use of various cut-up processes. Gysin explained that "poets are supposed to liberate the words – not chain them in phrases," and later claimed that "the semantic distribution of these basic elements diverted them from their original meaning, thus revealing their real significance." Gysin was fond of other low tech and direct applications, such as using rollers to make paintings, a manual typewriter to make abstract patterns of individual letters, or using a tape recorder as a primary artistic instrument and medium in creating both sound poetry (again re-invented after related experiments by Kurt Schwitters) and music. From a recording of the phrase “I Am that I Am” came “I Am That Am I? Am I That? I Am!” Another work read “Junk is no good baby. No junk is good baby. Is baby good” No junk! No junk baby is good. Junk is goooood, baby … No!” Some of his music is available on CD, but future musicians, like David Bowie, Laurie Anderson, David Byrne, and Lee Ranaldo (of Sonic Youth), seem to be more influenced by his literature and ideas (used sparingly) than his music. However, Gysin did later produce two albums with the jazz experimentalist Steve Lacy. 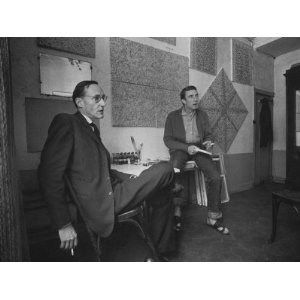 Gysin and Burroughs famously collaborated on the epic 200 page The Third Mind, both a collection of collages, visual poetry, and a manuscript for a manifesto of the cut-up form. In many ways, Gysin rediscovered and refined his “cut-up” technique from the Dadaist generations use of “the laws of chance” and the technique of “cadavre exquis” (or “exquisite corpse”). Similarly, Gysin’s ideas again came to prominence in downtown New York milieu of the late 1970s and early 1980s, where it greatly influenced Keith Haring’s early collages and came to the attention of the young Jean-Michel Basquiat. Gysin’s idea of the cut up, as filtered through Burroughs and Haring, served as both an influence on Basquiat’s work and theoretical justification for Basquiat’s natural proclivities. In Chapter 7 of my book on Basquiat I give a couple of examples of his spontaneous adaptation of the cut-up technique. Here let me just mention that Basquiat's assistant at the time, Stephen Torton, told me that Basquiat related his interest in the cut up to his use of multiple panel paintings, such as the 20 foot long 7 canvas Toussaint l’Overture vs Savonarola (1983). This related to both the mix of images and subjects in the work, the mix of painting and collage, and to the placement of the panels, which were painted in one order and moved around many times before being fixed and hinged together in the final work. In Chapter 4 I also relate Keith Harring's description of how, soon after he arrived in New York to attend the School of Visual Arts in 1978, he developed an interest in the “cut-up” technique of Burroughs and Gysin -- taking scissors to their typewritten pages and re-writing the mixed up text. For Haring the philosophy behind this “somehow tied together all sorts of things that I was seeing ––the way SAMO was using language on the streets, the way Jenny Holzer was using language –and the whole performance aspect of language.” At the time this applied more to the poems he read at Club 57 than to his art, but soon he was covering the streets (or at least the bottom of lamp posts) of downtown New York in Xeroxed collages of New York Post headlines, such as “Reagan’s Death Cops Hunt Pope,” “Pope Killed For Freed Hostage,” and “Reagan Killed by Hero Cop.” Although these clearly were extensions of Gysin's technique, they also reflected Harring's unique political stance on the world, and influences by the phrases his friends Jenny Holzer (in her printed and posted "truisms") and Jean-Michel Basquiat (using the graffiti tag SAMO) had already started putting up on the streets in their own way. Haring also used the concept of the Third Mind (a new entity created from the combination of two originals) in describing the collaborations of Basquiat and Warhol in the mid-1980s -- one of the few positive contemporary commentaries on these works. Later artists mixed Gysin’s ideas with their own, using play, disjunction and overlap through the selective use of fragmentation and recombination with elements of chance along with more conventional means. But Gysin spent his life experimenting with the implications of his ideas, creating a body of work in many mediums that was a byproduct of this process. Grian Gysin was the subject of an interesting retrospective at the New Museum which featured his films, collage poetry, music, and a reconstruction of his strobing Dreammachine. It was a great opportunity to see some of the unpublished visually intricate pages of The Third Mind displayed in the original. Here's another, and another. There was much more to Gysin than the cut up. For a flavor check out his many books (His more narrative novel The Process is available to look through), or start with The Brian Gysin Reader and the catalog to the New Museum show. I also recommend the appreciative small introduction at the always stimulating HiLowBrow (http://hilobrow.com/2012/01/19/brion-gysin/) -- and while you are there, check out their current artist in residence, the New Yorker Vijay Balakrishnan.